The law will establish a two-year moratorium on the NY Department of Environmental Conservation’s (DEC) controversial 2013 plan to exterminate New York’s mute swans by 2025 and declare the birds a “prohibited species,” which has been under revision because of backlash from Friends of Animals and the public. We did it! 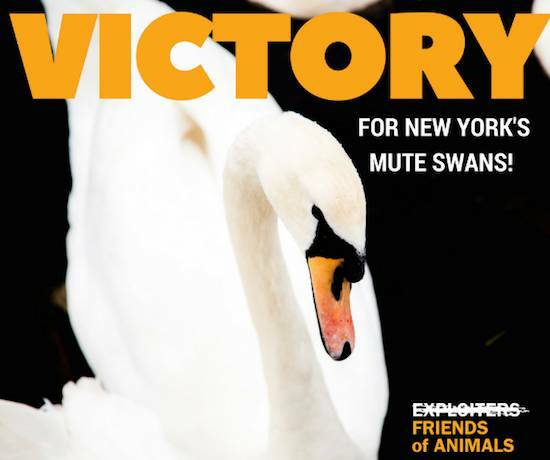 Thank you to all of our supporters who took action and urged NY Governor Andrew Cuomo to sign the mute swan saving bill into law. Drafted with input from Friends of Animals and introduced by Senator Tony Avella in 2014, the bill protects the states 2,200 mute swans from a government-sanctioned death sentence. After being vetoed twice by the Governor, this is an example of what type of victories can be achieved with perseverance and the support of our members. The law will establish a two-year moratorium on the NY Department of Environmental Conservation’s (DEC) controversial 2013 plan to exterminate New York’s mute swans by 2025 and declare the birds a “prohibited species,” which has been under revision because of backlash from Friends of Animals and the public. The law also requires DEC to demonstrate that the swans have caused actual damage to the environment or to other species, including humans.